This Paper Pieced Heart Quilt is a project that was so fun to do, from the very beginning -- picking out the pattern -- to the very end - delivering it to my friend for her new baby -- and every step in between. I've already told you many times how much I love our annual trip to New Hampshire and the shopping day my daughter and I look forward to. Of course we always go to Keepsake Quilting in Center Harbor to browse and touch and sometimes even purchase the beautiful fabric they have there. I love to have a project in mind when I go there so I can make a purposeful purchase, so before our trip a few years ago, I decided I would make a quilt for a friend who would be having her first baby soon. I poured over patterns and books and ideas for what seemed like forever, and then I received my Keepsake Quilting catalog in the mail. One spin through that and I had my pattern! I ordered it right away and received it in no time. Then I set to work studying the pattern because it was a paper pieced project, a technique I had never used before and didn't really understand how it worked. I traced the designs onto paper and cut them out and used scrap fabric to practice and I really loved the technique. It was so easy to get nice sharp points on those triangles. Then it was time for vacation and I knew exactly where I would be buying my fabric. This would be no Wal-mart fabric quilt. I was going whole hog and buying my fabric from a real honest to goodness bonafide Quilt Shop -- also something I had never done before. What fun that shopping trip was! I knew what colors I was after, and the selection at Keepsake Quilting is almost overwhelming, so it took me Forever to settle on my fabrics. I was so excited to get home and start cutting and piecing. 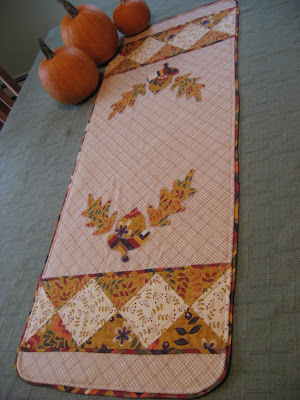 This is what the quilt looked like after I had sewn up the border pieces and spread it all out on the ping-pong table. My friend has always had a thing for hearts in any form, and she didn't know if she was having a girl or boy, so I picked fabrics that would be good either way and I thought this heart design was pretty gender neutral. And here it is all sewn up and quilted and backed and bound. Don't you just love that pieced border? All the purples pointing out and the greens and yellows pointing in -- very clever. That's what the pattern called for, so don't think *I* was the clever one! I just followed the directions! I also love how the squares inside the nine blocks are tilted and the hearts are placed a little cockeyed on them. And then the outside border of green and the purple binding just finish it off so nicely. 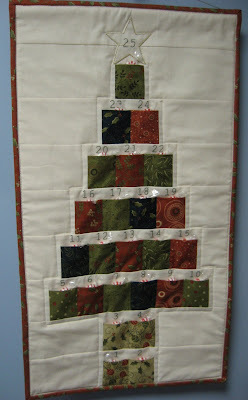 I hand quilted this piece along most of the stitching lines, except for the green sashing between the blocks and the green border inside the triangle border. In the sashing area, I used a ruler and marked random straight lines going at odd angles to each other and quilted over them. In the wide green border area, I marked off evenly spaced triangles and stitched them with smaller triangles inside them. If you click on the picture, you can see these details in the enlarged version. So that was my paper pieced heart quilt in purples and greens. What a fun project and quite a learning experience. I learned how nice it is to shop for fabric at such a wonderful quilt store with such knowledgeable staff and excellent customer service. I also learned that paper piecing is the way to go if you haven't quite perfected piecing odd angles. What's your favorite quilt pattern or technique? Leave a comment and let everyone know. I love your design! I have only tried one wall hanging paper piece, and I loved it. I have to admit, that even though it's probably one of the easiest quilts to make, I still love the "Around the World" quilt. It looks very "countryish" in a basic way. Maybe it's so fun because it's so quick. Your friend will be thrilled to wrap her new baby in that fabulous quilt! Isn't paper piecing a fabulous technique? I love it for the precision I get - my piecing isn't so accurate without guidelines to sew on, lol.